There are many musicians and bands playing at Treasure Island Music Festival, and all of them are worth knowing, but Shamir is the one you need to keep an eye out for. The 20-year-old has been active for the last two years, with one album out on XL Recordings that has garnered nothing but acclaim. 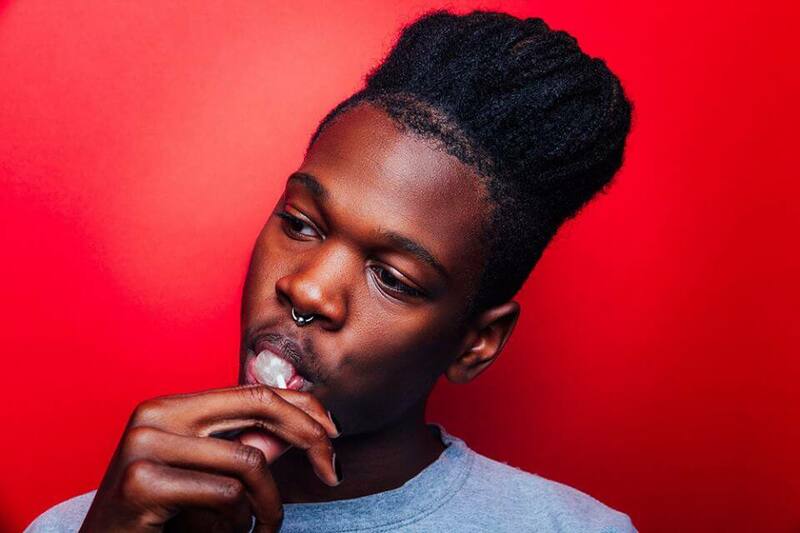 Shamir's solo project originally was meant to just be a side project to the punk band Anorexia, but after sending some demos to Nick Sylvester of Godmode Music, everything changed for Shamir. The Bay Bridged: So I hear you like Fefe Dobson? S: Um, Fefe Dobson is my everything, like no one really understands. Especially because I'm American so no one believes me. TBB: Yeah I was obsessed for a while too, I would try to make my friends listen to her, but no one was ever as excited as I was. S: That's basically me with everything. TBB: Haha same! So what's your favorite song by Fefe Dobson? S: She actually has some things she released pretty recently, maybe last year or two years ago called "Charge," it's a really good song. And also "Everything" from her first album. That's a really good one. Oh and "Don't Let It Go To Your Head," that's a really good song [laughter]. TBB: So you're touring with Marina and the Diamonds right now? How is that? And you're touring with Years and Years in the UK soon too? S: I am, yeah. It's been amazing, we're [Marina and Shamir] on our second date today, and Years and Years after this. It's been great. TBB: I am a huge fan of both of them, so I couldn't even imagine and you're all so great, so it makes sense. (Writer's note: I said more here but the audio was bad and I was nervous) Who are musicians and bands you want people to know about? S: There's this really cool band from New Jersey, ROMP, that I saw last year for the first time. They're working on a new album and they're just really good. TBB: Here's a random question, to keep this interesting: Do you like otters? S: Um, yeah. They're really cute. Actually, I really do like otters. The way they swim and everything. They're really cute. TBB: Can I still call your relationship hotline? S: I haven't had any time to answer that all I wanted to, but I think it's still open. There's been crazyness with touring and everything. (You hear that kids! Get free round the clock advice for all your relationship needs. TBB: Are you excited for this weekend? Anyone you're excited to see? S: I'm not too familiar with the lineup, Chvrches is playing right? TBB: Yeah, they are and so is FKA Twigs. S: Did you say FKA Twigs? I haven't seen her since last year, on my birthday, so that will be great. I have to revisit the lineup, I have just been in my own little world, living day by day. TBB: I know how that can be. (Probably not that well though.) You know how everyone has that band in middle school that they were obsessed with, and may now be a little embarrassed by but understands that this band was a huge influence on them. Without that band, they wouldn't be who they are today. Who is that band for you? S: I mean, I don't believe in guilty pleasures, I take full responsibility for everything I like. I guess I should be ashamed to say this, but I'm not. But I was and still kinda am, because it's hard to not be obsessed with something anymore. I'm pretty obsessed with Tokio Hotel. They had good songs to this very day, I listen to it here and there, and I am always like "this is still good." TBB: That's the best part of listening to a band you used to love, even it's just for nostalgia value, because now you can recognize that there was a reason you loved them. S: And they play their own instruments! Which was so rare. They were kinda killing the game. TBB: What is your morning pump up song? S: Well, I am not really a morning person. I don't usually wake up before noon. I have really been into the Go-Go's lately, and I really love their song "Heads Over Heels." I know that's super throw back, but I think that's a good wake up song. TBB: I am a huge fan of yours and I really love how your music just makes me not feel alone. It makes me think about times I've been upset about specific things, and then the music makes me get over it and want to be happy. Your lyrics are more melancholy while the rhythm is very upbeat and poppy, and I really love that about them. What are some techniques you use when writing? S: I just to like to write about how I feel really, and I think I like to write about things that people tend to go through as they grow older. So I think a lot of my album is about me growing up, especially being between the ages of 18 and 21 because that's how old I was when I was writing the songs. I guess that's where the relatable messages are coming from, because people around my age are going through it, and the older people have already gone through it. It's just something everyone can kinda relate to it. TBB: If you were stranded on a deserted island, what are three things you would want with you? S: My guitar, maybe something to go fishing with, and a carton of cigarettes. I mean being on a island would seem very stressful and I would probably want a cigarette.